(P1) Waterfalls are among the most reliable places to catch a rainbow, but only two on the planet offers up a regular display of its close cousin, the moonbow: Cumberland Falls in Kentucky and Victoria Falls on the Zambia-Zimbabwe border. Also called a white rainbow, a moonbow appears when moonlight (which is sunlight reflected off the moon) in the days just before, during, and after a full moon hits the mist generated by the falls. Because we can’t see colors well in low light, a moonbow appears white, reports BBC Travel, though photographers can use long exposures to capture its actual colors. Moonbows are occasionally, but not regularly, seen elsewhere in the world, including at Yosemite Falls in California. (P2) What makes Cumberland Falls and Victoria Falls so unique is that they boast just the right amount of splash along a wide enough (rather than deep and narrow) gorge so that moonlight can reach down and across the mist. CNN notes that because sunlight is much stronger than moonlight, moonbows are rainbow’s fainter cousin. They’re temperamental in other ways: Cloudy nights can prevent the bow from forming, and Niagara Falls on the US-Canada border has lost its moonbow thanks to light pollution. Bustle reports on one photographer who in November caught a similar fogbow, which forms in the fog, arching over a solitary tree in Scotland; it went viral on Instagram and Twitter. 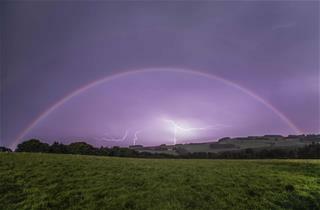 Have you ever seen a moonbow? If yes, describe it. If not, would you like to see one? Why or why not? Are there any beautiful waterfalls in your country? If so, where? Is light pollution a problem in the city or town you live in? If yes, how can the light pollution be reduced? Where is one of the most dependable places to see a rainbow? The moonbow is paler than a rainbow and appears _________ in color. Who can catch the true colors of a moonbow? Which is more powerful, sunlight or moonlight? What was captured in Scotland that went viral on social media?